Record Description GRI-9 is boundary stone number nine of the first 21 around Grinton Parish starting from Stolerston Stile and reaching as far as Gibbon Hill. It is on the Grinton-Ellerton boundary about 500m south-east of Sharrow Hill. It is inscribed on the east face D and ED. D is thought to signify the Drax family of Ellerton Abbey, and ED to indicate a period when the family used the name Erle-Drax, which would date this part of the inscription to sometime between 1755 and 1887 (see additional notes below). The inscription D would therefore be of an earlier date. The top of the stone has broken off leaving just the bottom part of another inscription. It looks a little like the bottom of an Ordnance Survey benchmark, which was an early system of marking altitudes. The full mark would be three lines converging to an arrow point immediately below a horizontal line indicating the line of altitude. The system was implemented between 1841 and 1860, and has long since been abandoned. The OS retains an online database of surviving benchmarks but none are recorded for this area. 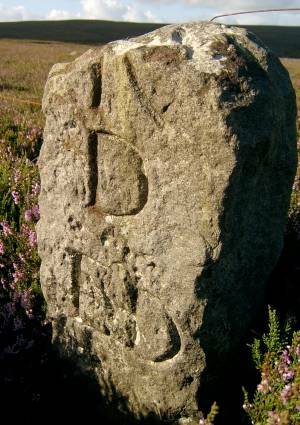 This might be explained if the stone was broken by the OS surveyor in a failed attempt to inscribe a benchmark - possibly for 1300ft. On the other hand, the marks might be part of something else entirely. 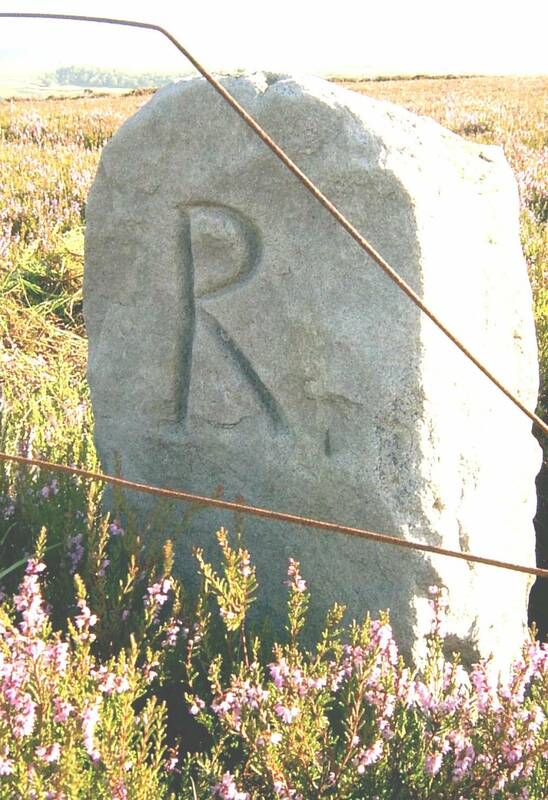 On its west face (the Grinton side of the boundary), the stone is incscribed R. Suggestions are invited for its meaning. Additional Notes Ellerton Abbey estate was held by people with the surname Erle-Drax from 1755 when it was inherited by Thomas Erle-Drax, the eldest son of Henry Drax and Elizabeth Ernle, heiress to the Erle family estate in Charborough, Dorset. The last person called Erle-Drax to hold Ellerton Abbey, John, died in 1887 leaving the estate to his son Richard, who adopted the splendidly quadruple-barrelled surname Plunkett-Ernle-Erle-Drax, but called himself Richard Drax for short.